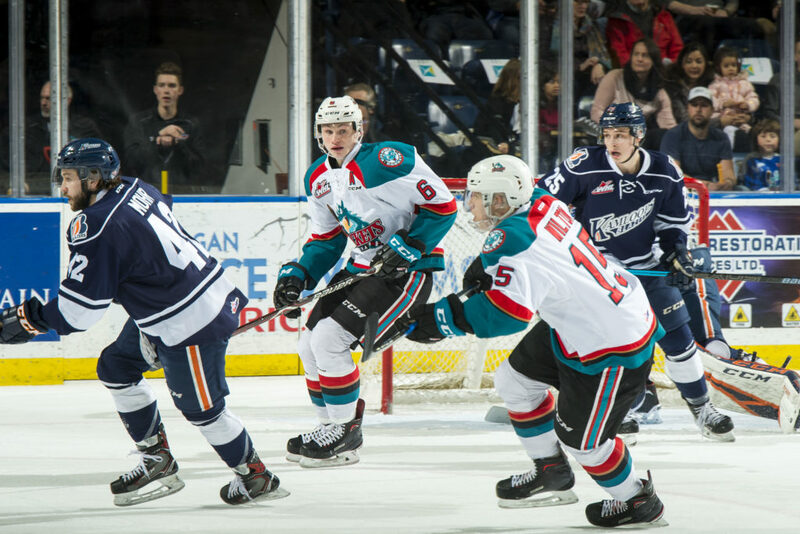 The Kelowna Rockets will hit the ice to face a couple of division foes this weekend. They’ll battle the Prince George Cougars at Prospera Place on Friday night and then head to Kamloops to take on the Blazers Saturday. The Rockets fell to the Spokane Chiefs 5-4 Wednesday night at home. Forward Alex Swetlikoff says that they’re going to use positives. Tomorrow is the final time that the Rockets will take on the Prince Geroge Cougars during this regular season this year. They’ve previously met nine times this year already, with the Cougars holding the edge in the series. The Cougars were in Kelowna on September 28th where they claimed a 4-2 victory over the Rockets. Two days later Kelowna travelled to Prince George for back to back games on September 28th and 29th. The Cougars won the first game 3-2, while Kelowna responded the next night with a 5-2 win where Leif Mattson (2G, 1A), Kyle Topping (1G, 2A) and Nolan Foote (1G, 2A) all had three-point nights. The next three games needed extra time. The Rockets won 4-3 in overtime off the stick of Nolan Foote on October 27th at Prospera Place. Prince George claimed a 4-3 win in overtime back on November 14th at the CN Centre, and the Rockets fell to the Cougars 2-1 in a shootout at Prospera Place on January 4th. Kelowna and Prince George last met during a doubleheader in Prince George back on January 11th and 12th. The Rockets fell 7-2 the first night and 4-0 the next night. Following the game Friday night the Rockets will then head out on the road to face the Kamloops Blazers Saturday. The Blazers are also in action tomorrow, they host the Vancouver Giants. Kelowna and Kamloops have squared off six times this season already. They opened the regular season against each other with a home-and-home series; the Blazers were victorious on home ice with a 4-1 win over Kelowna on September 21st, the next night they defeated the Rockets 3-1 at Prospera Place. They then played another home and home series; the Blazers defeated the Rockets 3-2 in overtime on December 28th, but Kelowna responded the next night with a 2-1 win at Prospera Place. The Blazers defeated the Rockets 4-3 at the Sandman Centre on January 5th. The two teams played last Saturday where the Rockets downed the Blazers 2-1 in overtime. Kelowna and Kamloops will play each other three more times during the regular season. They’ll get reacquainted on Saturday, February 23rd right here at Prospera Place. The two teams will then finish off the season series with another home-and-home series starting in Kamloops on Friday, March 8th before heading back to Kelowna the next night. The Rockets enter Friday night with a 21-26-4-1 record which places them third in the B.C. Division with 47 points. They’re nine points up on the fifth place Cougars and two points ahead of the Blazers who sit in fourth place. Kelowna trails the Victoria Royals by eight points, while the Vancouver Giants sit atop the conference standings with 73 points. Kick your weekend off with the Rockets, head down to Prospera Place and cheer them on as they battle the Cougars. Tickets are on sale at selectyourtickets.com, at the Prospera Place box office or by phone at 250-762-5050.